Kanye West is in rare form these days: Since rejoining Twitter on April 13, the rapper has been ranting about everything from politics to how he’s “nice at ping pong” (whatever that means). Yet one topic he’s kept tightly under wraps? His home with Kim Kardashian West. That is, until now. Ever since purchasing this Los Angeles estate in 2014 for $20 million, the couple has been renovating up a storm—yet, remarkably, the famously publicity-hungry pair have not released one photo or video of how it’s going. Even the crew for their reality show “Keeping Up With the Kardashians” was forbidden to set foot inside. But this week, midway through an especially lengthy (and controversial) pro-Trump Twitter rant, Kanye decided to give his followers a peek behind the curtain … and boy, were we surprised by what we saw. 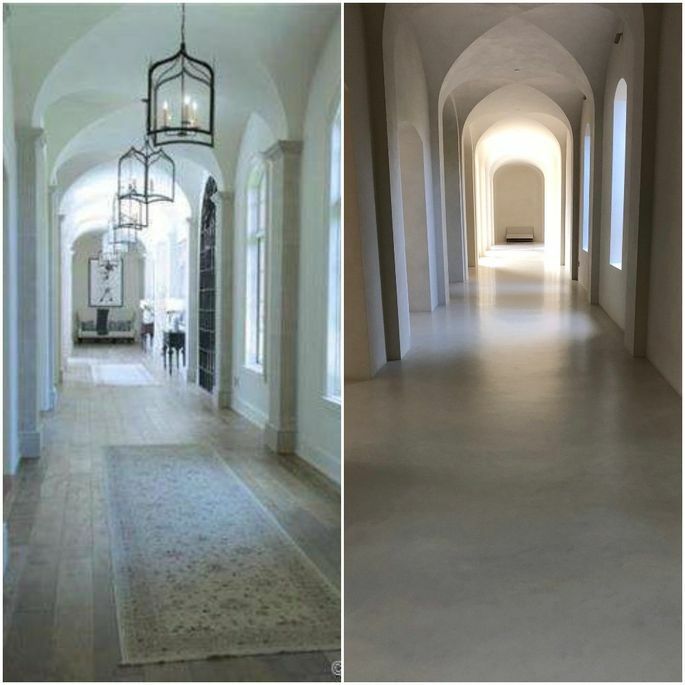 West posted three photos from inside his 15,700-square-foot home: two shots of a cavernous-looking hallway, and one of what appears to be a living room. And what immediately struck us is wow, the decor is minimalist to the nth degree. Take, for instance, the before-and-after shots of the hallway below. Keep in mind that the left photo is before they started renovating … and the right pic is how it looks now. They purged those nice lights, the artwork, everything! We’re not sure how far along they are in the renovation, but the overabundance of beige and under-abundance of furnishings in these photos seem to suggest that progress is slow-moving. Or, given that they’ve been working with architect Axel Vervoordt—who’s known for his minimalist, neutral aesthetic—maybe it’s completely finished, and this is just how they want Chez Kimye to look. In fact, this home’s decor style is totally consistent with the stripped-down aesthetic of West’s fashion line, Yeezy. 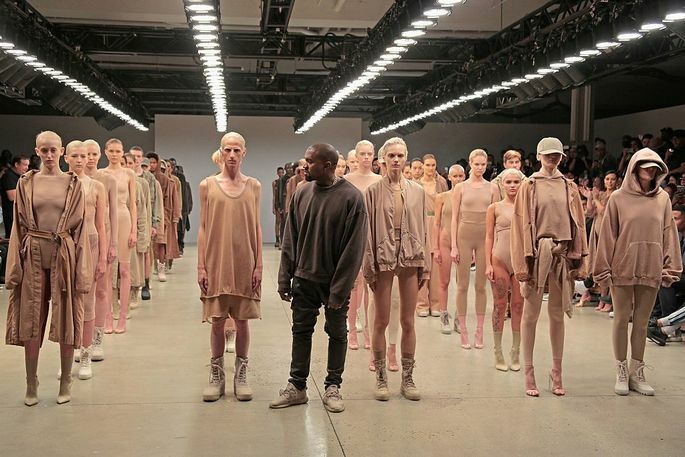 The same signature beige hue is a constant in the clothing, shoes, and accessories he’s rolled out in six collections so far. Yet while the home might be designed to play up the dramatic architecture, the limestone finishes and neutral color palette are not exactly child-friendly—which is a little sad, since the Wests do have three young kids. Diana Stelin, a professional artist who used to run DTR Modern Galleries, agrees that “The walls look stark and cold, and it is lacking warmth and personality.” Yet she believes this is because the interior decorating might not be complete. She actually sold art to West a few years ago, including pieces from Andy Warhol, Damien Hirst, and Jeff Koons. “Kanye has really great taste in art, so I’m assuming they just haven’t gotten to placing things in the right spaces,” Stelin says. Or here’s another theory to explain this odd choice in decor. Kim and Kanye want to be the shining stars in their own home? Sounds about right.